A Rotator Cuff Tear may or may not be a significant problem for you. Depending on age and activity levels, existing tears may or may not be worth surgical repair. But despite what doctors will tell you, there is no mystery as to the cause and development of torn rotator cuff tendon injuries. They can show up during physical exertion or slowly tear more and more over time as the overall ecology of the structure gets less and less healthy/functional. If you're here you already know that you have a tear. Or at least, you think you do. Do you have a torn rotator cuff tendon? If you have had an MRI, or literally can't lift your arm (for instance), that confirms a tear, then you do. If you just have pain, even disabling pain, and limited range of motion, that MAY or MAY NOT include a tear. 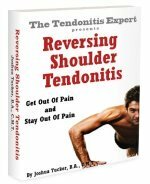 You can have disabling pain and NO tear with just Rotator Cuff Tendonitis. Tendonitis can show up anywhere. It's a dynamic, and it's the ultimate cause of the 'normal wear and tear of aging' that is responsible for 'degenerative' tendon damage (which can then lead to a tear). Western hospital medicine mentality generally consists of this mindset: "Little information is available about the epidemiology of rotator cuff tears...... "
Doctors tend to think that tears happen for no particular reason...that tendons weaken and degrade over time because of 'age'. That's kind of like blaming torn rotator cuff tendons on 'magic'. Rotator Cuff Injury happens for a very specific set of reasons. So, what causes rotator cuff tears? A car crash, a fall or impact in a sporting event, falling off a ladder. These events cause sudden application of force to a structure. If the structure can't withstand that force, a tear can happen. Partial tear or full tear, a torn rotator cuff tendon injury from an impact event is a potential reality for any healthy person. The rotator cuff structures are, as a general statement, smaller and weaker than some other structures on the body, and they just can't take that much sudden impact force. Its not what they're designed for. Surgery is usually the option for young and middle aged victims of a torn rotator cuff injury. For the elderly population, not so much. It is important to note that aside from the tear, other mechanisms kick in place post-injury, and these can be as problematic over time as the tear injury itself. Doctors tell millions of people that their torn rotator cuff tendons are due to 'normal effects of the aging process'. And then shrug their shoulders and prescribe anti-inflammatory medications like Ibuprofen, pain killers, rest, physical therapy, etc. Depending on the age of the individual and extent of the tear, they may or may not recommend Rotator Cuff Surgery. We get old and eventually, decrepit. It's just the way things are, and degeneration of tendon tissue is a normal part of that. On one hand, that's true. On the other, it's a total cop out by the medical industry. 'Degeneration' of tendon tissue is 'normal' but it's not without predictable causes. Degeneration happens over time due to the tendonitis dynamic, meaning, decades of tightness, nutritional lack, and inflammation process all add up to forces being applied to the tendon that it cant withstand and it slowly starts to become unhealthy and begins to break down and die. Eventually it gets so unhealthy that it can't withstand anymore force on it, and it tears. Tendons can tear due to lack of health as well as from overapplication of force. Unfortunately doctors think it's normal and unavoidable, just the way things go, and that it happens by magic. Unfortunately they don't apply any of that 'science based medicine' they claim to be experts in. If you want to avoid rotator cuff tears from tendon degeneration then you may want to consider keeping your tendons strong and healthy. If you have normal wear and tear rotator cuff pain, or VERY small tendon tears on rotator cuff tendons, then you can start working with the Reversing Shoulder Tendonitis program. If you have a big or complete tear, then you're looking at Rotator Cuff Surgery (or a determination that surgery isn't worth the risk or effort). A torn rotator cuff tendon will not respond well to Rotator Cuff Exercises. It's torn. The structure isn't working correctly. More tension is going to increase the chances of further tearing. Stretching or Rotator Cuff Strengthening can't help a ruptured tendon. Making dysfunctional muscles (and their tendons) work more/harder doesn't make them more functional, it (usually) makes them less functional. If you have a big tear (or a complete rupture), beware anybody telling you that exercises of any kind will help. To heal a rotator cuff tear, you need to repair the tear surgically, and then recover from surgery. And THEN you need to reverse the negative factors that keep things tight and painful, aka 'the tendonitis dynamic' (again, the Reversing Shoulder Tendonitis program). If you don't, chances are high that you'll have problems again at some point in the future. Surgery isn't a cureall, it just puts the pieces back together again. Return to the top of this Rotator Cuff Tear page.